With presidential elections announced in Venezuela, the US State Department moved quickly to declare that the contest was illegitimate and that its results would not be recognised. But less than a year ago the tune was quite different, as a cursory look through State Dept. briefings and press releases will show. We also examine how political developments from the past year have led to the current scenario, and how US demands for “free and fair” elections are not only arrogant and hypocritical but also misleading. We begin by taking a look at what the US State Department was constantly saying less than a year ago. 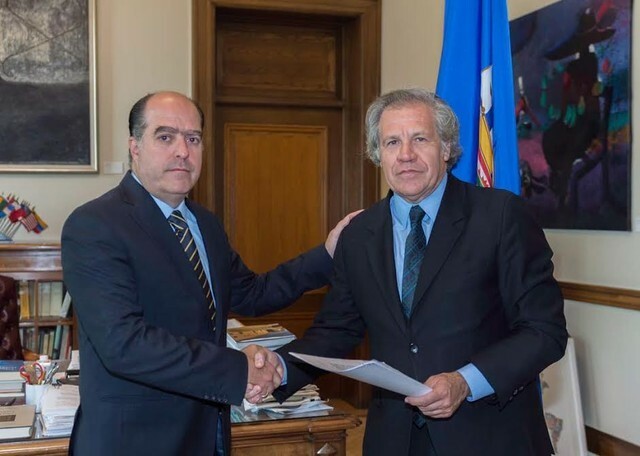 We could equally document the statements of the OAS and its secretary Luis Almagro, the Venezuelan opposition, US-allied regional governments, or the mainstream media. But it is easier to just go to the source. Sadly, when it comes to Venezuela, none of the mainstream actors and media will deviate from the State Department. US officials were adamant that elections were the only legitimate way forward. So what happened since then to make the US no longer believe that elections should be held tomorrow? Maduro made a bold gambit of calling elections for a Constituent Assembly to solve the country’s problems. The Venezuelan opposition decided not to participate and vowed to stop those elections from taking place. They miserably failed, and on July 30 over 8 million people voted in what was a remarkable show of strength by chavismo. From that point both the opposition and the US were trapped, unable to move on from their blunder. And soon cracks started to open. After months of violent protests claiming that the “dictatorship” was about to be overthrown, the opposition then turned to its supporters and asked them to go and vote in regional elections. The result was a disaster, with chavismo winning 18 out of 23 states. The opposition could not muster more than the usual vacuous claims of fraud, and then (mostly) boycotted the December municipal elections, which resulted in a chavista sweep of over 90% of the municipalities. With the political momentum on its side, the government decided to schedule presidential elections for April 22. 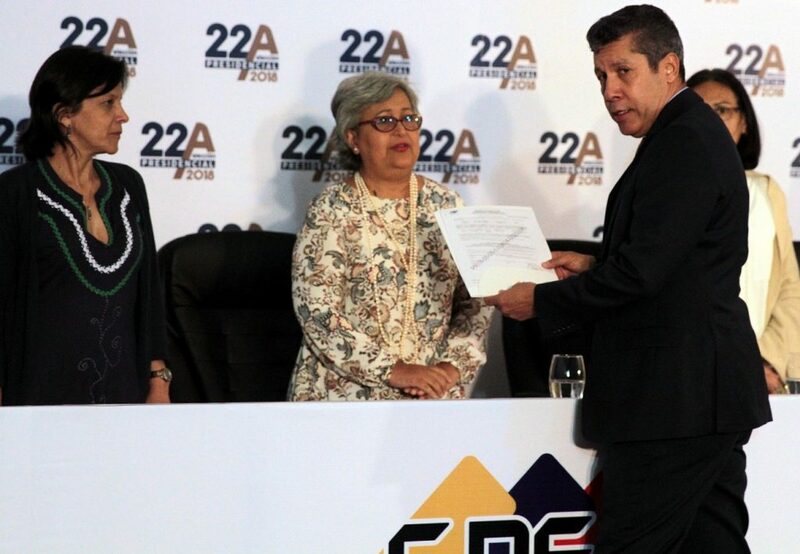 According to Jorge Rodríguez, head of the government’s delegation in the Dominican Republic dialogue, this date was agreed with the opposition MUD representatives. But with opposition figures more discredited than ever the US decided to pre-emptively unrecognise the vote, simply because an opposition victory is far from guaranteed. In the end the main opposition parties followed suit in boycotting the election, but former Lara governor Henri Falcón broke ranks and registered as a candidate. The MUD promptly expelled him, and the US allegedly threatened him with sanctions to stop him from running. Ironically, as a former chavista, Falcón might be the ideal “moderate” opposition candidate to attract the votes of disaffected chavistas. But the imperial masters are past hedging their bets, they are all-in for regime change. After talks with Falcón and the forces backing him, the vote was postponed to May 20. The MUD doubled down on their position that “there are no opposition candidates” in this election, and up to now there has been no reaction from the State Dept.. At the same time it is hard to read this as anything but a move to further sideline the MUD after they backed out of the dialogue to stick to the hardline coming from Washington. We should also take a moment to refute the US assertions about elections not being “free and fair” and the presence of international observers. The “free and fair” demand means to discredit all previous electoral processes, whose results did not please the US. Nevertheless, as many people outside the mainstream media have explained, the Venezuelan voting system is as hard to fool as it gets. In all the elections where the opposition decided to take part they got to place their observers in every voting centre. Tens of thousands of audits took place to match the electronic and paper tallies, witnessed and approved by these opposition observers, and there has not been a single allegation of tampering with the vote count (2). We could argue that the government makes use of state resources in its political campaigns. While this would hardly be exclusive to Venezuela, we should contend that the opposition has also made use of government resources, they just happened to come from the US government through its array of NED and USAID “democracy promoting”, “civil society building” programs, and that is just the overt part of it. Complaints about media coverage are also absurd when private media has the largest share of viewership and circulation and is overwhelmingly against the government, to say nothing about international media. The demand for international monitoring is, at best, very dishonest from the State Department. First of all, despite the opposition walking away at the 11th hour, Maduro vowed to implement what had been agreed in the Dominican Republic dialogue, which included an open invitation for international observers to come to Venezuela for the upcoming election. But that is not to say that previous elections did not have international observers. Organisations such as the Latin American Council of Electoral Experts (CEELA) have been present and endorsed the procedures, as well as other observers from multiple countries, Latin American and otherwise. The problem is that they do not dance to the tune of the US State Department. It is absurd to claim that the presence of the OAS is a boost for fairness and transparency. We do not even have to look very far, just take the recent elections in Honduras. Massive, documented fraud allowed Juan Orlando Hernández to revert what was an irreversible trend in favour of his opponent. Having the US empire on your side will allow you to overrule statistics. This was so blatant that even the OAS and EU missions had to raise questions. But in the end Hernández was declared the winner, the State Dept. gave its approval and all these champions of democracy fell in line. An even more shameful event took place in the Haiti presidential election of 2011. After the first round, the US (through the OAS), simply ordered the Haitian authorities to advance Michel Martelly to the second round, despite him not being one of the two most voted in the first round. They threatened to cut off all aid if this did not happen. So when these officials talk about the OAS as some guarantor of decency, not even they believe it themselves. A small digression: we do not mean to equate democracy with elections like US officials constantly do in the above statements. The Venezuelan leaders have on occasion also fallen for this reductionism. Whether they believe it or not, it is the most obvious way to expose the western hypocrisy on the matter. This reduction of democracy to voting has been one of the biggest triumphs of capitalist hegemony. People are effectively convinced that their entire political participation should be the single act of marking a cross on a ballot every 4 or 5 years. Politics is thus detached from the rest of society and “commodified” like everything else in capitalism, with campaigns becoming mere advertising shows and the wealthiest literally buying their influence. The Bolivarian Revolution is revolutionary precisely because it challenged the inevitability of representative politics and opened new spaces for protagonist, participatory democratic experiments. From the communes to workers councils, even to the constituent processes, and despite the natural contradictions that have emerged, we have seen an expansion of democracy in its literal sense – popular power. In the end it seems like the ideal scenario for the US would be something like the Yemeni model: a single, US-backed candidate on the ballot. With elections coming up this year in key US allied countries (Brazil, Colombia and Mexico), all of which have the potential to bring to power someone less friendly to US interests, the US cannot afford a defeat in Venezuela. These arrogant, imperial demands that the Venezuelan elections should satisfy are just meant to provide cover for the growing threats and aggression against Venezuela, and the uncritical echo chamber that the media has become on this matter is a crucial asset. With suggestions of an upcoming oil embargo against Venezuela, at this point the goal is clearly to impose as much suffering as possible on the Venezuelans in order to topple the government. For all its lofty rhetoric, the State Department is not looking out for the well-being of the Venezuelan people. Neither are its Venezuelan and regional puppets, nor the mainstream media, whose positions are simply State Dept. communiques with make-up. 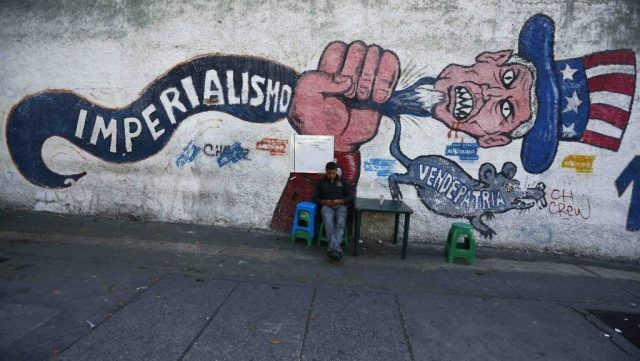 Standing up to these shameless imperialist attacks is essential if we wish to stand in solidarity with the Venezuelan poor and working-class, allowing them to freely choose their path, both in the upcoming elections and beyond. (2) A possible exception is the gubernatorial race in the state of Bolívar last October, where some electoral acts were circulated on social media showing a mismatch with regard to the electronic totals in the CNE website. But, perhaps because it would undermine the other constant claims of fraud, the opposition did not press the case.